This concrete book is about the color of butterflies. The student researched color in animals as linked to evolution, survival, courtship, reproduction and other activities. 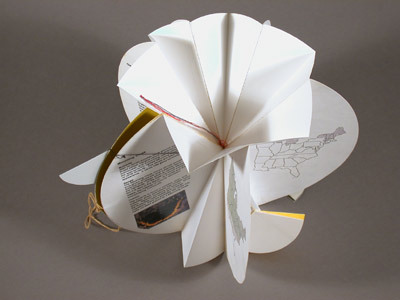 Each double page in the book opens to a full circle and includes a color indicator of the butterfly and a map of its habitat within the United States. Student: Kim Sookie. 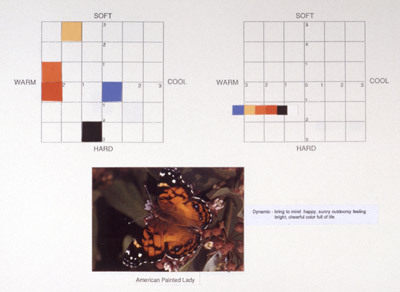 The colors of each butterfly are plotted within a diagram developed by Shigenobu Kobayashi in his book "The color image scale". 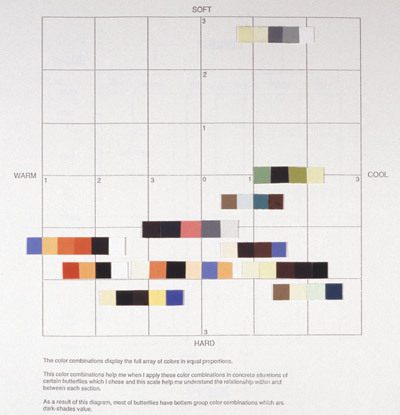 Colors are arranged horizontally from warm to cool and vertically from soft to hard. Each bar includes the basic colors from a single butterfly and is positioned on the diagram after the individual color components within the bar have been averaged, to determine its location relative to the other bars. Butterfly color. Concrete book. 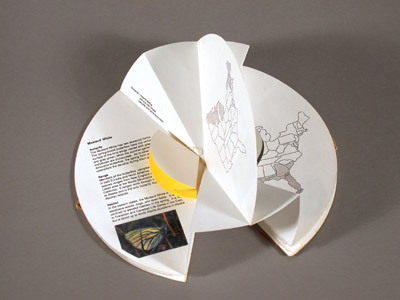 Opens to a series of circles. I conducted this graduate seminar in color theory from the standpoint of basic research. I gave the students a general framework of various theories and directed them to explore color from an evolutionary perspective. I pointed out the relationships between nature and expression and culture and communication and how color has been approached within those relationships. The students chose a specific area of investigation, developed an idea, and completed a final project on their research. The course syllabus, the abstract from the butterfly topic and the final piece are included below (PDF). Student: Kim Sookie.